This image, captured by NASA's Solar Dynamics Observatory (SDO) on March 10, 2012, shows an active region on the sun, seen as the bright spot to the right. Designated AR 1429, the spot has so far produced three X-class flares and numerous M-class flares. 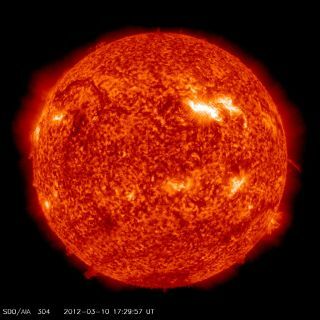 Two new solar flares erupted from the sun today (March 10), blasting streams of plasma and charged particles into space. The outbursts were both categorized as M-class solar flares, and exploded from the surface of the sun at 12:27 a.m. EST(0527 GMT) and 12:44 p.m. EST (1744 GMT), respectively, according to NASA's Goddard Space Flight Center in Greenbelt, Md. Today's flares are the latest in a string of powerful eruptions from a sunspot region, called AR1429, which has been particularly active this week. This dynamic region has already unleashed three strong X-class solar flares. On Tuesday (March 6), two powerful X-class eruptions triggered the strongest solar storm in eight years, according to solar physicists at the Space Weather Prediction Center, which is jointly operated by the National Oceanic and Atmospheric Administration (NOAA) and the National Weather Service. Space weather scientists use five categories — A, B, C, M and X — to rank solar flares based on their strength and severity. A-class flares are the weakest types of sun storms, while X-class eruptions are the most powerful. Today's flares also unleashed a wave of plasma and charged particles, called a coronal mass ejection (CME), into space. This wave is expected to reach Earth on March 12, on the heels of a previous CME released by an earlier flare this week. When these particles arrive at our planet, they could interfere with satellite communications and even power grids on the ground. They are also likely to spark auroras, or northern and southern lights, which are caused when charged particles collide with Earth's magnetic field. Skywatchers this week have already spotted particularly amazing views of the lights, and are gearing up for more.